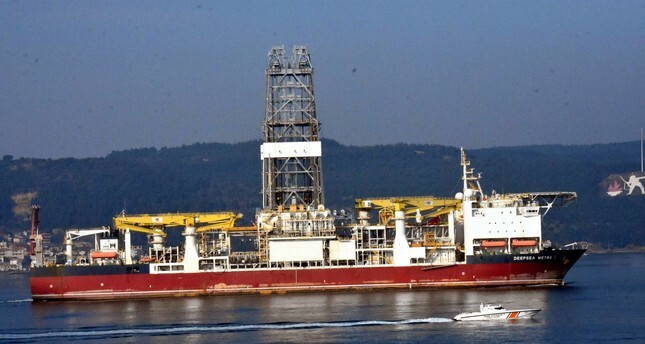 Turkey’s second drilling ship bought by the state-owned Turkish Petroleum is heading toward a shipyard in Yalova in the Marmara region for maintenance and renovation, pro-government newspaper Daily Sabah reported. The Deepsea Metro-1, was bought at a cost of $262.5 million in order to expand Turkey’s exploration and drilling operations sailed off at Algeciras Port in Spain and passed the Çanakkale Strait on Friday. Energy and Natural Resources Minister Fatih Dönmez announced the arrival of Turkey’s second drillship in his Twitter account. The Turkish Foreign Minister Mevlüt Çavuşoğlu said on Thursday that two Turkish vessels would begin offshore drilling for oil and gas near Northern Cyprus in the coming days, signalling another round of flaring tensions in the eastern Mediterranean. Turkey’s first drillship, Fatih [the Conquerer], started drilling in October off Alanya, a district in the southern province of Antalya. Later, Turkey also started shallow well-drilling in the southern province of Mersin. Turkey and Cyprus have stepped up their efforts for gas exploration and drilling over the last half of 2018, while Ankara and Nicosia have been at odds over Turkish Cypriot’s share in gas revenues. Ankara claims territorial waters which overlap with those of Cyprus, and also supports the territorial rights of the breakaway Turkish Cypriot State in the northern part of the island, which is only recognised by Turkey.